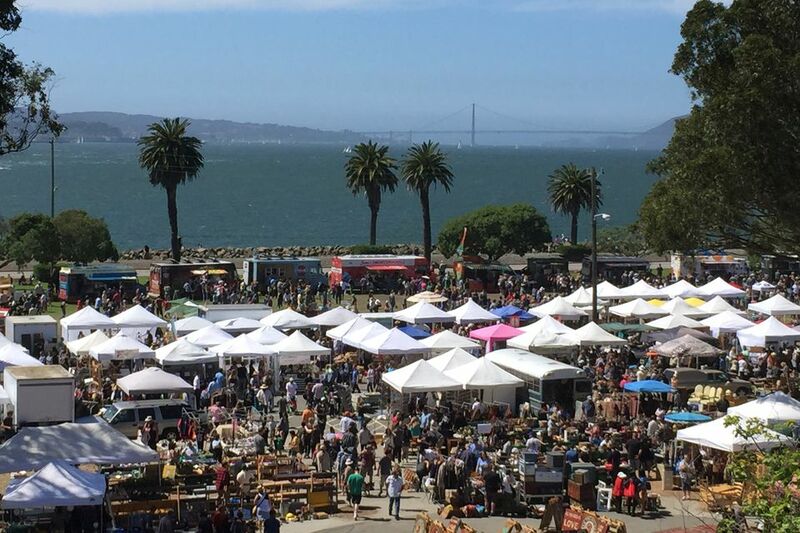 Since its 2011 debut, Treasure Island Flea has been a hot spot for Bay Area flea market fans. This flea market started to give indie designers a place to showcase their goods, the flea offers handmade, upcycled, and one-of-a-kind merchandise alongside traditional vintage flea market finds. When you get hungry, the food options are as diverse as the merchandise. In addition to the vintage furnishings and fashions you'd expect from a San Francisco-area flea market, Treasure Island Flea also offers lots of hip, handcrafted merchandise from indie designers. Many of the new items are made from recycled, upcycled and repurposed materials. The view is amazing, but it gets breezy. Dress in layers. If you like to haggle, expect to get better prices toward the end of the day. Also, the vendors selling handmade merchandise may not negotiate as much as those selling used and vintage goods. Concessions are available, including specialty foods. Don't eat before on your way to Treasure Island Flea. Visit the fabulous food trucks instead. Live music and full bar available to add to your weekend fun. Don't take photos of handcrafted and repurposed merchandise without getting the sellers' permission. While it's true that you might be able to make an item yourself, you didn't make that one. Get cash before you go to Treasure Island Flea. Though some vendors do take credit cards, many don't. You'll have more haggling leverage with cash anyway. Treasure Island Flea is a curated market, which means the organizers are choosy about their sellers. Vendors are selected on both the uniqueness of their goods and the number of existing sellers offering similar merchandise. Submit your application well in advance of your target market date to ensure time for the review process.